rasie yur hand if u saw this coming. knuckles.....crazy......their both the same.. Wallpaper and background images in the shadow el erizo club tagged: shadow's friend has gone insane!!!!!!!. palabra clave: shadow's, friend, has, gone, insane!!!!!!! Lol, i always thought knuckles was a litle over protective of his emerald. 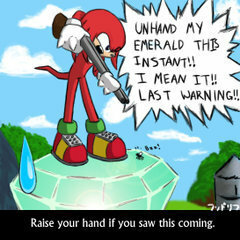 lol knuckles is so crazy just because there is a fly on his emerald!lol! THAT KNUCKLES IS HUCH A IDIOT!.TRY IMAGINING KNUCKLES SHOOTS THE EMRALD AND BROKE INTO TINY PIECES KNUCKLES GOES CRAZY MAD! !THAT WOULD BE FUNNY!!! ha ha ha knukles looks like hes gonna kill that fly poor fly! ?